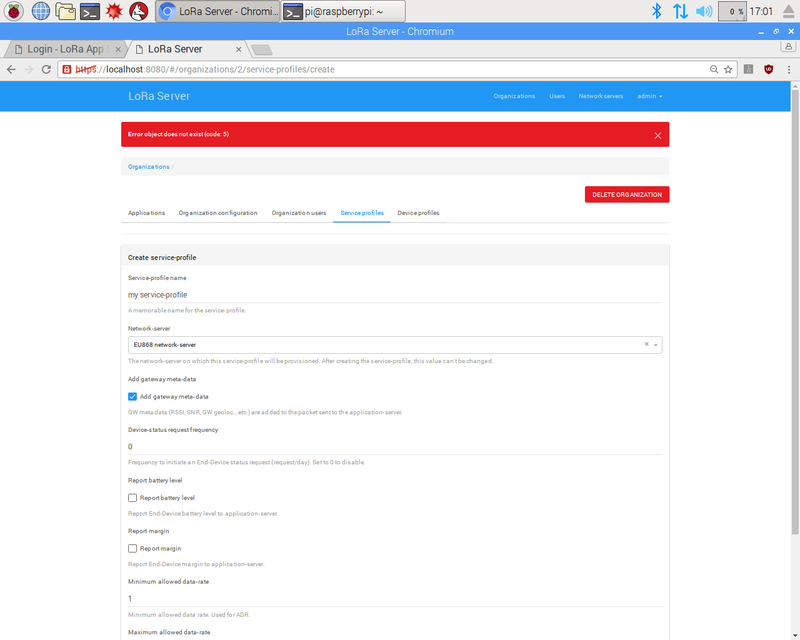 Today i started to install LoRa Server on Raspberrypi 3 (OS: Jessie). My aim is to install network server (LoRa Server) and Application Server (App server) on the Pi, while LoRa gateway bridge on the Multitech conduit. As first part i installed both LoRa server and App server on the Raspberrypi. Since i was newbie to linux commands, i had some difficulties in installing the packages. 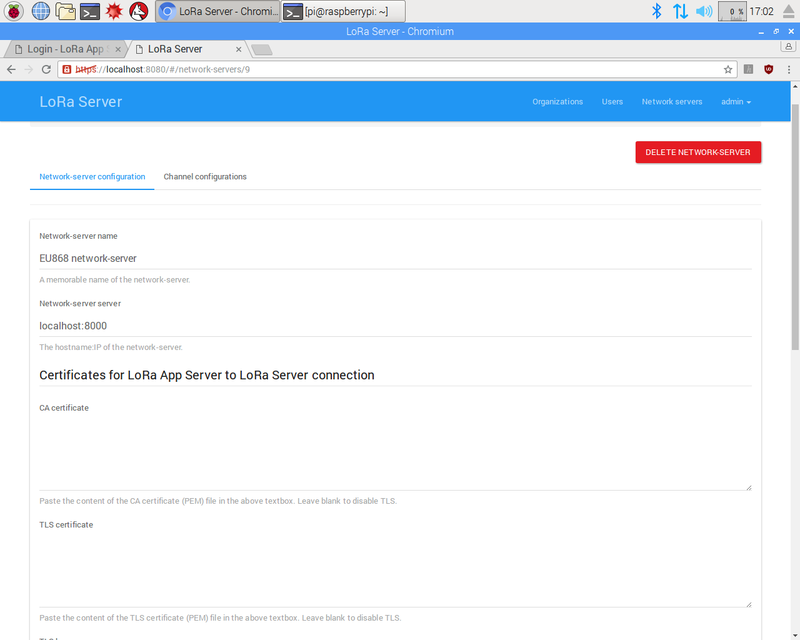 But after spending some time and with the help of google and different forums i am able to successfully install all the packages for LoRa server and app server. i did not find anything in the config file about this variable. When i would finish my first step, I would proceed and install LoRa Gateway bridge on my multitech conduit AEP version. I had trouble configuring the servers too and there I describe how I solved the issues I found. Feel free to ask for specific configurations. I am so thankful to you. I will definitely have a look and come back to ask from you. Unfortunately, till now, i am not successful about setting up the LoRa server (network server and application server) on my raspberry pi3. Since, there are lot of concepts it would be kind if you could guide me with patience. I am summarizing what i have done. jwt_secret=“abc” /// just took from your post, i am totally blank about security issues. I have left all the ca_cert,tls_cert, tls_key as blank (similar to default configuration.) Since it is optional so i thought i could do it without them. Not the best for security, but should work fine. Do you really need to change those? Personally, I avoid changing these unless really necessary. I believe these credentials should match the broker’s where the lora-gateway-bridge expects to publish to. No problem. However, there are some of the certificates that need to have their path correctly indicated for lora-app-server. For loraserver, should be fine. Please, check these configurations and try again. If the journal still can’t be found, please, feel free to ask again. I installed the application server on the same raspberry pi3 using the instructions posted here. Similarly, in the configuration file (/etc/lora-app-server/lora-app-server.toml), i have the following changes. I have left all the ca_cert,tls_cert, tls_key as blank (similar to default configuration.). i changed them to default, where we dont need username and password. Mar 01 11:57:02 raspberrypi loraserver: time=“2018-03-01T11:57:02Z” level=error msg="backend/gateway: connecting to mqtt broker failed, will retry in 2s: Network Error : dial tcp [::1]:1883: getsockopt: connection refused"
Mar 01 11:57:04 raspberrypi loraserver: time=“2018-03-01T11:57:04Z” level=error msg="backend/gateway: connecting to mqtt broker failed, will retry in 2s: Network Error : dial tcp [::1]:1883: getsockopt: connection refused"
I think i have set mqtt credentials as in the docs section. Create a password file for your mosquitto users, starting with a “root” user. a new password for the user. Note that further configuration is possible, such as limiting the topics to which the various users can have access. These settings are beyond the scope of this document. May be due to these i am unable to connect. I think i should do a fresh installation again of all the packages. So, i will start from scratch again. you should be able to connect without credentials. Oh, but i just re installed the raspbian jessie and now starting from again. I will be in touch with you and update you about my progress. I finally managed to get some positive output. I have only changed [dsn] in both configuration files (lora server and lora app server) and added the following security. Mar 01 15:43:56 raspberrypi systemd: Started LoRa Server. Mar 01 15:43:57 raspberrypi loraserver: time=“2018-03-01T15:43:57Z” level=info msg=“setup redis connection pool” url="redis://localhost:6379"
Mar 01 15:43:57 raspberrypi loraserver: time=“2018-03-01T15:43:57Z” level=info msg="connecting to postgresql"
Mar 01 15:43:57 raspberrypi loraserver: time=“2018-03-01T15:43:57Z” level=error msg="ping database error, will retry in 2s: dial tcp [::1]:5432: getsockopt: connection refused"
Mar 01 15:43:59 raspberrypi loraserver: time=“2018-03-01T15:43:59Z” level=info msg="backend/gateway: TLS config is empty"
Mar 01 15:43:59 raspberrypi loraserver: time=“2018-03-01T15:43:59Z” level=info msg=“backend/gateway: connecting to mqtt broker” server="tcp://localhost:1883"
Mar 01 15:43:59 raspberrypi loraserver: time=“2018-03-01T15:43:59Z” level=info msg="no network-controller configured"
Mar 01 15:43:59 raspberrypi loraserver: time=“2018-03-01T15:43:59Z” level=info msg="applying database migrations"
Mar 01 15:43:59 raspberrypi loraserver: time=“2018-03-01T15:43:59Z” level=info msg="backend/gateway: connected to mqtt server"
Mar 01 15:43:59 raspberrypi loraserver: time=“2018-03-01T15:43:59Z” level=info msg="starting downlink device-queue scheduler"
Mar 01 15:44:43 raspberrypi systemd: Started LoRa Server. Mar 01 15:43:59 raspberrypi systemd: Started LoRa App Server. Mar 01 15:44:00 raspberrypi lora-app-server: time=“2018-03-01T15:44:00Z” level=info msg="connecting to postgresql"
Mar 01 15:44:00 raspberrypi lora-app-server: time=“2018-03-01T15:44:00Z” level=info msg="setup redis connection pool"
Mar 01 15:44:00 raspberrypi lora-app-server: time=“2018-03-01T15:44:00Z” level=info msg="handler/mqtt: TLS config is empty"
Mar 01 15:44:00 raspberrypi lora-app-server: time=“2018-03-01T15:44:00Z” level=info msg=“handler/mqtt: connecting to mqtt broker” server="tcp://localhost:1883"
Mar 01 15:44:00 raspberrypi lora-app-server: time=“2018-03-01T15:44:00Z” level=info msg="handler/mqtt: connected to mqtt broker"
Mar 01 15:44:00 raspberrypi lora-app-server: time=“2018-03-01T15:44:00Z” level=info msg="applying database migrations"
Mar 01 15:44:54 raspberrypi systemd: Started LoRa App Server. I hope this is the right configuration. 2018-02-18 16:32:14.334 UTC  loraserver_ns@loraserver_ns DETAIL: Password does not match for user "loraserver_ns". Connection matched pg_hba.conf line 94: "host all all ::1/128 md5"
you still have to change a postgresql configuration file. (or use another editor) to edit pg_hba.conf. As I said in the other post ([release] LoRa Gateway Bridge 2.3.0 / LoRa Server 0.24.0 / LoRa App Server 0.18.0), this is not the safe way to configure the database. You’re letting any IPv6 host to access it. However, it make things work for testing until I have time to test the proper way. INFO setup redis connection pool                   url="redis://localhost:6379"
INFO backend/gateway: connecting to mqtt broker    server="tcp://localhost:1883"
That may be fine for testing purposes, but it means that anyone may connect to your mosquitto broker, so don’t do this for any serious case (also see this, allow anonymous won’t always give access to topics, which could be confusing). Instead, follow carefully the docs on securing mosquitto. When in need to debug, try running programs manually to check the ouput directly so you can see what’s going on. In summary, relaxing conditions on services in which loraserver relies may be fine just to get it working for the first time, but now that you have, you should try to address all security issues that this creates. You’ll eventually have to deal with them anyway, so why not do it now while you are still configuring things? Agreed. I won’t leave my test environment, so it won’t do any harm, but definitely make it right as soon as possible. I think @iegomez could be right. I am thankful for your support guys :))) You are really amazing people. However, when i create service profile it gives me an error. I want to eventually view the data of node? am i heading to the right direction? Edit: i am able to add service profile. Yes you are on the right path! After you’re able to register a device for your application, you can check either the data received by the gateway or by the device. Look for the JSON field that represents the data, but keep in mind that it will be Base64-encoded. Could you tell me how to check if my Lora-gateway bridge is working properly or not? I have installed the lora-gateway bridge on the multitech conduit but i could not find any command to test that its functioning. Having the same issue that was mentioned here. And your example for a Postgres issue doesn’t seem to be my problem despite what you posted here at the beginning of last month. My Postgres seems to be working fine, and from what I can tell is on the port that my other files should looking at by default. This issue has come up multiple other times without any direct resolution from what I’ve been able to tell through this forum. If people are fixing their problem they aren’t sharing that fix for others like Osman here. It just seems to fall into place without any further comment.